Photographers throughout Los Angeles, with cameras in hand, will gather at Hollywood and Highland and Union Station to peacefully rally against the unnecessary treatment they have received from security guards, LAPD, and LASD while photographing in public places, and on the Metro. At about 1:30pm we will board the Metro and travel to Union Station for more picture taking. I’ve taken a few sporadic photos around the Metro areas, like my photo above. Since I’m on the move, I continue on to my next destination without any thought or confrontation. On Wednesday, I took some photos before boarding the Metro Red Line at Wilshire/Normandie. Then, while waiting at the train platforms for the Metro Gold Line at Union Station, I put my camera away. With my sunglasses and earbuds on, I saw a Los Angeles County Sheriff come into sight in the corner of my eye. It turns out that if he’s not at work or taking care of his son, he’s all about photography. He hasn’t been as active lately, but he’d like to be. 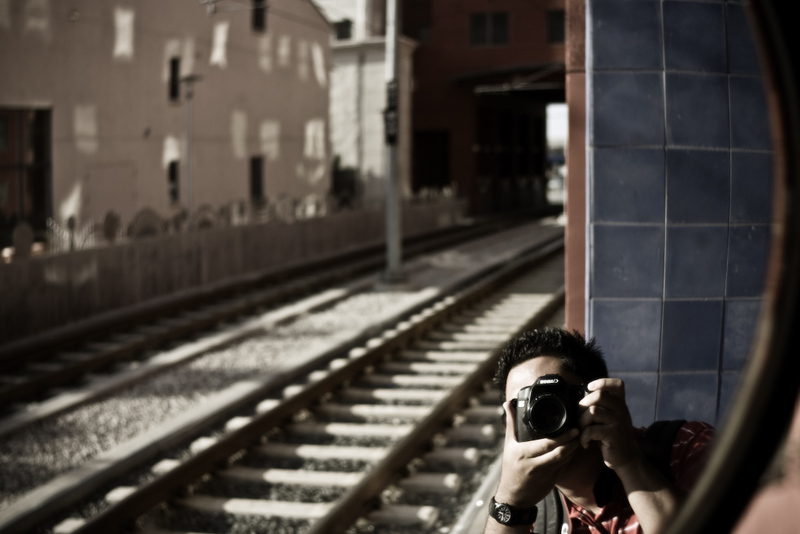 I gave him my card, offered to hang out to photowalk sometime, then boarded the light rail. He was really nice. Another time, I saw a photographer with a Canon “L” series lens photographing the length of the Gold Line light rail. She was taking photos for about three minutes until we left. Twenty feet from her, two LA County Sheriffs had a man sitting on a bench, wearing handcuffs. I don’t think enough people are informed. So, why do I plan to participate in this rally? With the frequency that I take photos, especially around the Metro stations, it’s bound to happen to me. I love street photography, so if I want more art to be created, we need to help those artists. We don’t band together and cause some sort of organized ruckus, ignorant people might push those artists to the point where they no longer want to create art. No kidding? That’s cool! What’s your role there? thanks for posting. we appreciate the support and can’t wait to see you there. I work as an intern doing transportation planning. More on the programming side though, not the design. Dude, I will. I am moving out in June and getting 900$ deposit back. Thinking about getting a used 30D + a 50mm 1.8 lens to start with. Thanks, man. I’m trying really hard. We gotta hang out and photowalk sometime. You know I’m always up for it (with a decent notice in advance). I’m sure you’ll post when you get the gear.